R' Nosson Kamenecki (r) tries and tries not to, but the proverbial foot drives deeper into the proverbial mouth! There's so much to be said about the one man crusade that is Reb Pinny Lipschutz ,zg"z. First it was the newspaper editorials that would not let up in the fight to have justice done for a fellow Yid. 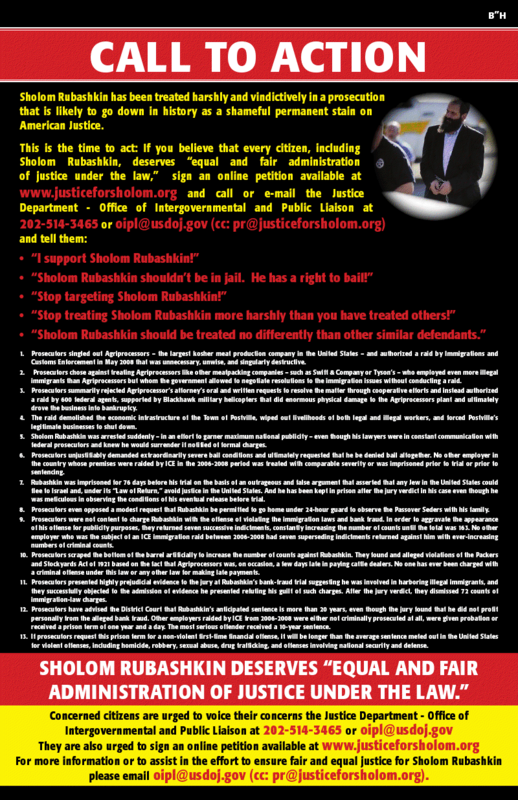 Then there was the pidyon shvuyim fund, where hundreds of thousands of dollars were raised by him - and the money continues to pour in - from Yidden who you would think could care less about a Lubavitcher and his troubles. (The SMR fiasco has changed lots of status quos.) Now, it's putting himself on the line, speaking to the people directly, telling them what he's seen, the facts in the case, and how they can help. For now we'll leave it at that, and hopefully speak more about it next week, be"h. For now watch the clip of his speech in Lakewood - with Roshei Yeshiva in attendance - and appreciate some of what he's doing. Zol der eybershter eich bentshen, Reb Pinchos, bekhol mili de'meytav! "בפרבר פודליבצה שבעיר זו (סלוצק) נולד רבינו הגאון רבי ברוך דב לייבאוויץ בחודש כסליו תרכ"ד"
"In the village of Podlivce, in this suburb of Slutsk, was born our Rebbe the Gaon Reb Boruch Ber in the month of Kislev, year 5624"
The line was taken from the book מלאך ה' צבקות, about the life of Reb Boruch Ber Leibowitz, zt"l, Rosh Yeshivah of Knesses Beis Yitzchok Kamenetz-Litovsk. published several years ago. Ok, so they know the town, they know the month and they know the year. I would say that they probably know the day too, wouldn't you? So why would they not post it? Here's what I heard from an eynikel of RBBL just today. Reb Boruch Ber was born bein hashmoshes between the 18th and the 19th of Kislev. So what does one who was born between the yohrtzeiten of Reb Boruch'l Mezhibuzher and the Mezritcher Maggid get named? Boruch Dov (Ber)! Simple enough and very practical, if you ask me. But I guess the one who put this fine book together had a bone to pick with Chassidim, even of that generation, and even the great Chassidic Masters, and he would have none of that in his book. Which is sad really, since RBBL was such a great unifier, one who everybody of all kreizen cannot help but have respect, and they had use him when causing such strife and divide. If that's the case - that it's simple revisionism of the first degree - then it's a crime against humanity. Plain and simple. The eynikel taynes that he heard it from Karliner Chassidim decades ago. Everybody (almost everybody) in the frum world has "his" Lubavitcher, like, lehavdil, every goy had/has his Moshke, who was a good Jew, unlike all other Jews who were part of the International Jewish Conspiracy, or whatever they called in the centuries before the last one. His Lubavitcher was good, not like the others. The good Lubavitcher may be family ("it happens in the shenste mishpoches") a former classmate, or a neighbor or acquaintance from work/business. In my blogging career I have become the good Lubavitcher to several people, some of whom really never knew Lubavitchers close up and personal before; all they knew was what they thought they saw or heard in Yeshivah. 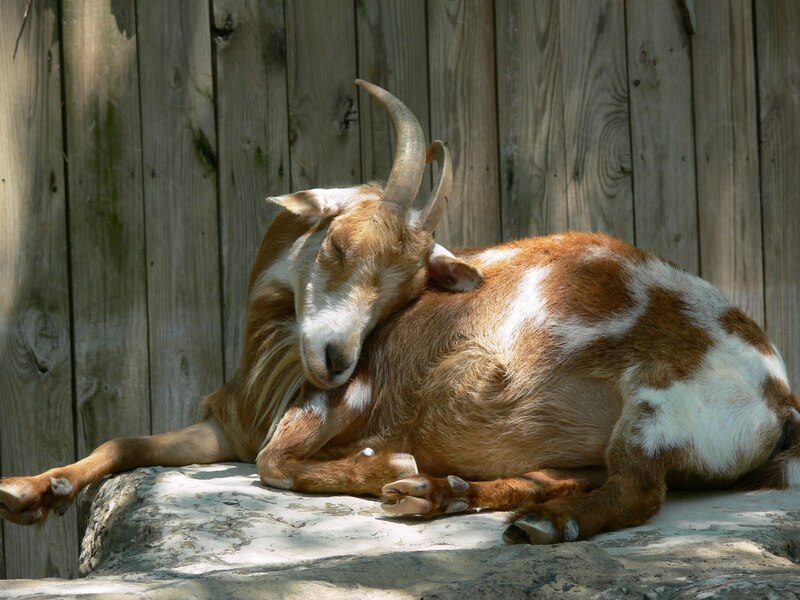 If I may say so myself: when they got to know me they realized that we have no horns and we practice the same religion than them, maybe even more fervently than them, and it's not as bad as they thought! That's not to say that with some people getting to know Lubavitchers is not the cure-all; they may meet the wrong type, or have negative experiences, depending on the situation. 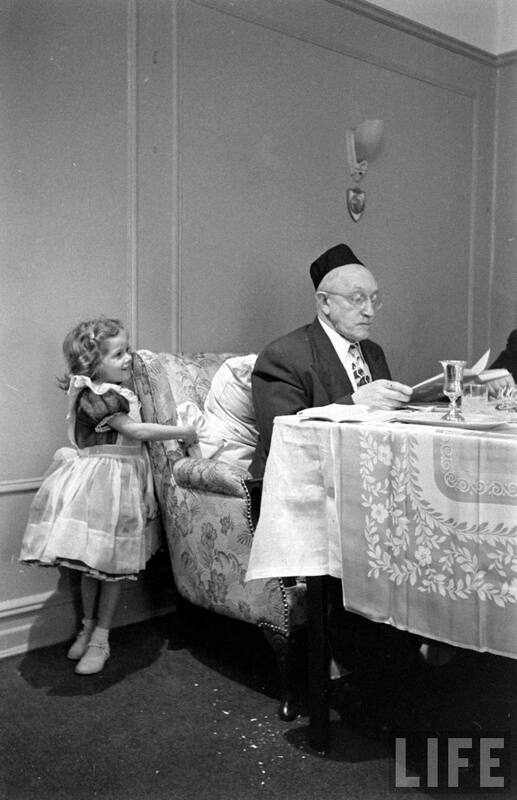 People like to have their Lubavitcher be a good one. It makes them feel good and that they're in the company of good people. Many of the old timers will tell you about the old days in cities like New York, Yerushalayim, or Montreal, where all frum yidden lived together in peace and harmony, and there was no animosity between groups. They'll say that they have only fond memories of those days and wish they could have them back. When asked why the feelings towards Lubavitch changed they'll probably point the finger at Lubavitch and blame them for moving out of the neighborhood, becoming more "moderen," going off the deep end, or all of the above. I'm not here to argue those points, only to tell you what the situation was like. When you had yidden like Reb Peretz Mochkin in Montreal at the helm in Lubavitch in Montreal, and you saw his davening and avodas hashem you put up with his strange behavior - what you found strange, and you respected him and were in awe of him. The same goes for Reb Sadyeh Liberow in Antwerp and many others. 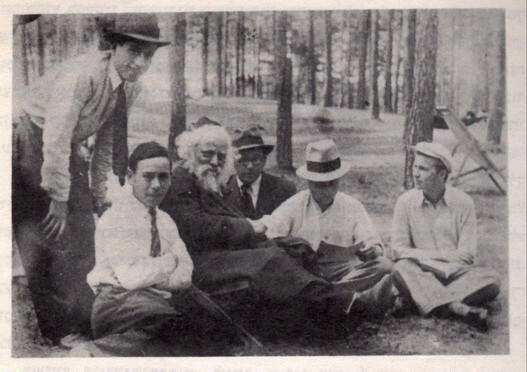 Today we lack Reb Peretzs so others can sit and point fingers and turn their noses at Lubavitch. I know I had more in this paragraph, but my browser closed on me and three hours of intermittent writing was lost. חבל על דאבדין. Which brings us to Reb Lazer Wenger, z"l. He was what you called a "good Lubavitcher" and was zocheh to an obituary from the American Yated for several reasons. (Not before they made it very clear as to why they were even writing about him, if you know what I mean.) One: he was the son of a Kletzker Talmid. (That doesn't always work for you if you leave that fold, but it dis work for him) Two: he was a sheiner talmid chochom. (It's tough to negate accomplishments in Torah, even if they come from a Lubavitcher - it's done, the negating, never mind, but it's still not so easy) Three: he taught and was fondly remembered by thousands of talmidim and talmidos in several different cities. 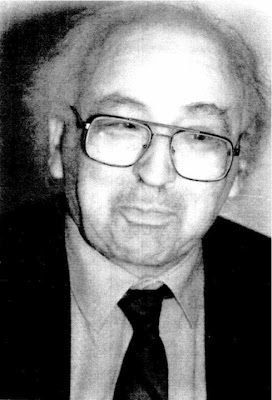 Four: He was a Rov in a semi-Lubavitcher/veltishe shul and was on good terms with all Rabbonim in Montreal. I say whatever it takes. Even though we know that we're in "galus" and need to please people who are terribly biased and prejudiced, we still need to work hard and aim to please those cannot easily be pleased, so that the name of Lubavitch is held in esteem. Rabbi Wenger may not have needed to work very hard at it, but he sure did accomplish that in Montreal, and that's not avek tzumachen. We need more of these so-called good Lubavitchers, despite the fact that it's degrading and maybe even dishonest to work hard to please those who will not be pleased. Not that I'm advocating doing it solely for the purpose of PR, but we need any incentive we can get. It's no different than the chassidim/yeshivaleit trying to please the MO, or the charedim trying to please the chilonim in Israel, you can try hard but one idiot can ruin it for all of you. But as long as you know that you're not one of the trouble makers you know you're on the right path. If those who have it in for you have no reason to knock you, then you're an asset to your community. From what I understand Rabbi Wenger didn't need to try to please, he didn't need ulterior motives, but some of us may need them, and if that's what it takes then so be it. Others do it for their own koved and reward, if you do it for the greater good you're still way ahead of them! I know there was more that I had to say, but alas, it was lost in a Firefox crash! I know I'll regret this, but here goes anyway. Some of you think that Lubavitch has a mountain of dirt that they hide. I see where you're coming from; you have the Himalayas when it comes to dirt you're hiding, so you assume the same is true with Lubavitch. But the truth is there may be details that were never made public, but other than that there's no real chapter in their history that's not out there and well-known. I say that with the utmost confidence, as hard as that is for many of you to believe. Take, for example, the period of Yud Shvat 5710 to 5711, or even until after 5713, when RaSHaG finally accepted the new reality in Lubavitch and wanted to be a part of it. It depends on your general level of knowledge; if you're above average you know all the details, if not, not. Judging policy by what a general boor in history knows is childish. Yes, ימי בראשית doesn't mention the ins and outs, but since when do we start and finish with a book put out by a few bachurim? 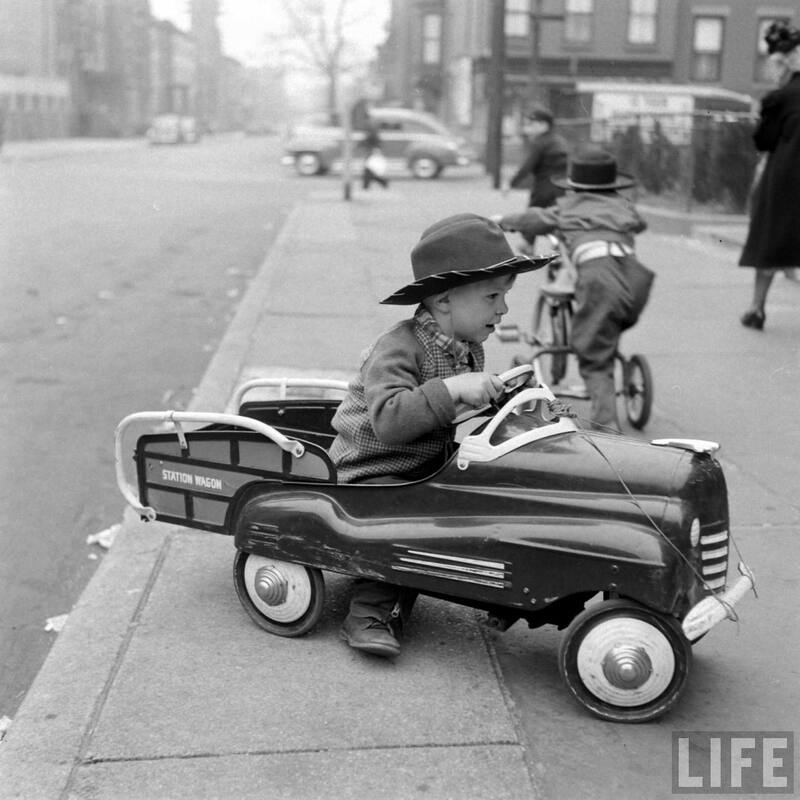 They decided not to get into the nitty gritty of things; back in '94 that was the way things went often times. I doubt they'd make the same book today, even those same guys. As far as Deutsch is concerned, I'm not sure what exactly he would "reveal" that wasn't known, despite the fact that he was livid at the end result of the book, calling it "lies" and worse. I guess he would've wanted to be the historical advisor to the book, then it would all be OK. After all, by now we all know that he has become THE authority on animals and the Mishnos and Gemoros that discuss them.... He'll tell you that himself. How he went from historian to zoologist is beyond me. So I was sent this letter by a reader. I guess there could be several reactions here. 1) it's a forgery. 2) he was suffering from Stockholm syndrome. 3) So what, it's natural after 20 years to be swept up by the prevailing mood in Lubavitch. 4) Wow! he really was mekusher! But why should it matter? Why should his life of askanus be measure by feelings of the heart and which we may never know? I understand the need and the will to have him on our side, but don't feel the need to vindicate him in the first place. The charges are silly, pay no heed to them. Those that want to believe that RaSHaG was slighted here and had it stolen from him will believe that no matter what the facts prove, and those that claim that he never came over to "our" side will always have those first two or three years to "back it up." So where does that leave the rest of us? Somewhere in the middle, I guess, as is the case with most other issues. It's become a burden, even to moderate, let alone write and respond. Maybe we need to change the format a little bit; give it a little injection of sorts. The way it's been doesn't seem exciting anymore. After all, in 5 years we've covered most topics already. What some of you have suggested, namely discussing a topic in Chassidic/Lubavitch history, IS a good idea after all! 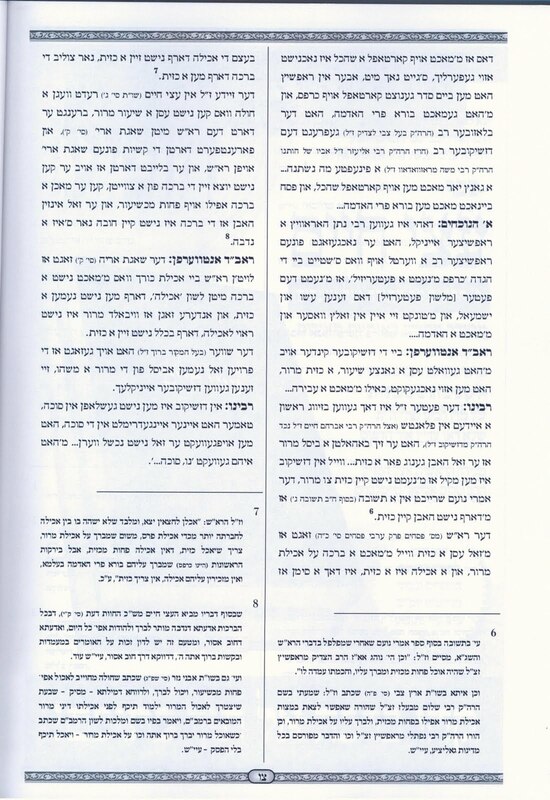 I was told that in order to maintain a sense of "credibility" that I need to comment on the CH Beis Din Psak that was issued by Mechon LeHoro'oh yesterday. You know, it's times like these that I really start to think that maybe I'm talking to a bunch of idiots, if you'll excuse my French. I have stated this many times and I have stayed true to my policy of really not discussing stam current event politics. Not from any kreiz. Which is what so many of you can't stand about me and this blog. If I'd be busy knocking other kreizen all day and highlighting all the infighting that goes on there, and I wouldn't write about Lubavitcher happenings, then you'd have a real case about me. But I don't, and you can't stand that. Then there's the general of me not caring. I could care less about which slate runs the CH community council or the Vaad Hakashrus. I may have maybe once cared about who is THE Rov in Crown Heights, but even that interest has long since passed. I do think that the fact that they went to D"T and may even listen to the psak is commendable in this day and age, as sad as that may sound, but other than that what is there to write?! So please. If you feel like you need to deflect critique from your group, go right ahead and send in the nasty comments. If they're quasi-intelligent and to the point I may even let them through. But don't expect me to write about the silly non-exciting politics. "My family has roots in Belz, both in Galicia, and in Hungary, with RYBR (Reb Yissocher Ber, ztzvk"l) and RAR (Reb Aharon, ztzvk"l) spending time in Hungary during WWI and WWII respectively. I'm very curious to know of the relationship between RAK, RMK (R Mordechai, Bilgorajer Rov ztzvk"l), and the Belzer chasidim. Particularly, if the Belzer chasidim were roidef RMR, who (at least in the whitewashed official history) was very getrei to RAR during difficult years, Also the circumstances of RMR's petira (1950), RAR's petira (1957) and the acceptance and non-acceptance of RBR (Reb Berel) as a youngster by old-time Chasidim, and his subsequent acceptance or rejection Be'meshech Ha'Shonim. 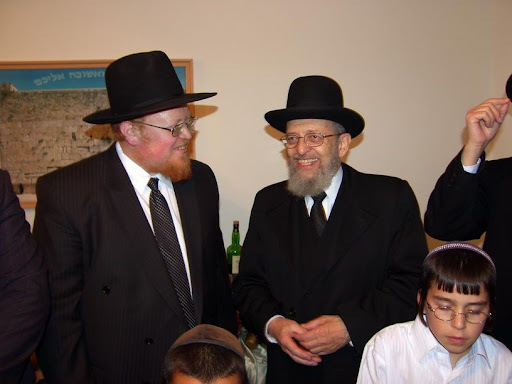 Just to throw in another name, Machnovka, which shtams from Sar Sholem ztzvk"l, (and Reb Shia'le and Reb Yissocher Dov - HT) as a alternate Belzer Rebbe. 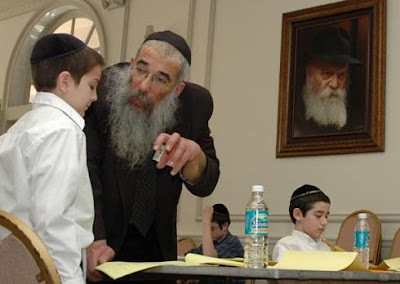 Were they actually "Belzer Mordim"? 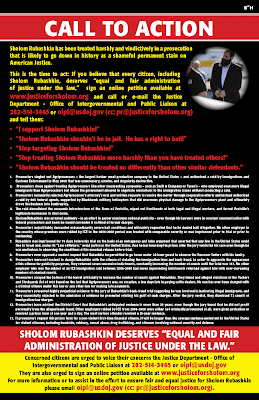 While we're at it, some analysis of the turnabout of Belz vis-a-vis Agudah, from amolige Doires to Haynt. - "Torah Hu, Ve'Lilmod Ani Tzorich." HT says: The question is obviously a very loaded one, and one that could set off a veritable firebomb, but I guess one that could be discussed here as good as anywhere. Almost anywhere; I suppose a Belzer shtiebel would be a better place... But I can vouch for the שואל, and he really means no harm. He's not in the mix at the moment and wants to learn more about a group very close to his heart. As far as I'm concerned I'd like to see Belz-Machnovke succeed, not because of any animosity I have towards Belz, but because of the "little guy" image they portray as opposed to the big bad Belzers with their Bais Hamikdosh. So let's hear from all you know-it-alls out there! "In Dzhikov one did NOT sleep in the Sukkah. If somebody happened to DOZE OFF in the Sukkah he would be awakened, so that he not transgress... 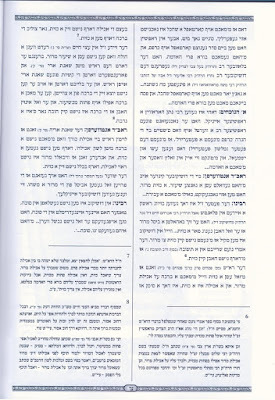 They would wake him by saying: "Nu, Sukkah..."
This is obviously not some Lubavitch propaganda piece, but a matter-of-fact discussion between two Rabbonim, one ah Satmarer and one a SIL of the Seret Vizhnitzer Rebbe, but an eynikel of the Gro. (Sternbuch, obviously) The problem is that in their eyes and in the eyes of many of their readers this is comparable to two people talking about - say, the Amshinover Rebbe and when he lights Chanukah licht. In other words it's cute. It has no real meaning to them, and definitely is not something that either they or those who claim to represent Dzikov today should follow. Which is where Lubavitch comes into the picture; had Lubavitch just said that "In Lubavitch we didn't sleep in the Sukkah," there would be no issue. People would either smile, roll their eyes, or maybe life a fist מתוך התרגשות, but that would be it. But once you follow that minhag, no matter what the source, that's when they lose it and start calling you all kinds of names. Which is fine if you don't believe in anything outside of mainstream Halochoh and don't have any such minhogim - in other words kalte Litvakes. But if you consider yourself the true followers of chassidic greats like Sanz and Dzikov and Ujhel and Belz (and the list goes on) then we have a problem if you condemn others who do like the Dzikover Zeide. If you do all the geshmake things like yud beis challos and fancy clothes and large scale Mitzvah tantzen, why not try something that might get you into a little hot water with G-d's lawyers? I'm reminded of a not-so-funny joke I once heard from a badchen at a family friend's wedding. Jokes like these have somehow become accepted in the frum world; I guess due to the lack of clean jokes you haven't heard? 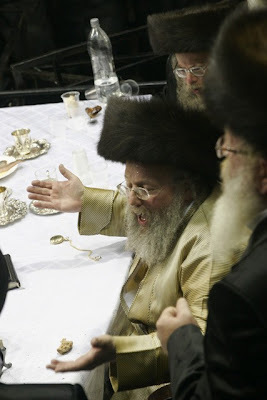 So the badchen says he once went to a wedding where the choson went and became a Lubavitcher chossid. "Yuh, Yuh, es pasiert in di shenste mishpooches!" he says. This man says he knows nothing about Lubavitch, so he follows along very closely, wanting to learn everything he can about them. Then, later at the Kabolas Ponim, they begin to sing a niggun. "Voos iz," asks the badchen, "voos zingt men yetzt?" So they tell him that the choson "geit zoggen a Ma'amar." "A Ma'mar? voos iz, di kallah iz a yevomoh?... I never found that very funny, but I remember it nevertheless, maybe because of that. Maybe I hold on to those not-so-pleasant memories for too long. You ought to check those links I posted and learn about unzer Shimon/Chimen. (That French spelling looks great, doesn't it?) Maybe now you'll know why Reb Chezkel Abramsky's son didn't succeed his father as Rosh Beis Din in London or elsewhere. Or why they never taught you about him in Mesivta. A freilichen shlissel challah/gelle matzos Shabbos. So over Yom Tov I had some time to look at the newly released sefer on Reb Yisroel Grossman, zt"l, dayan, Rosh Yeshivah, Vechulu, "גדול בישראל" they called it. It's a fascinating window into a world not many knew of; where one man was involved in so many different campaigns and battles for the character of the Holy Land back in the day, as well as being a major meyfitz of Torah and Chassidus for decades. 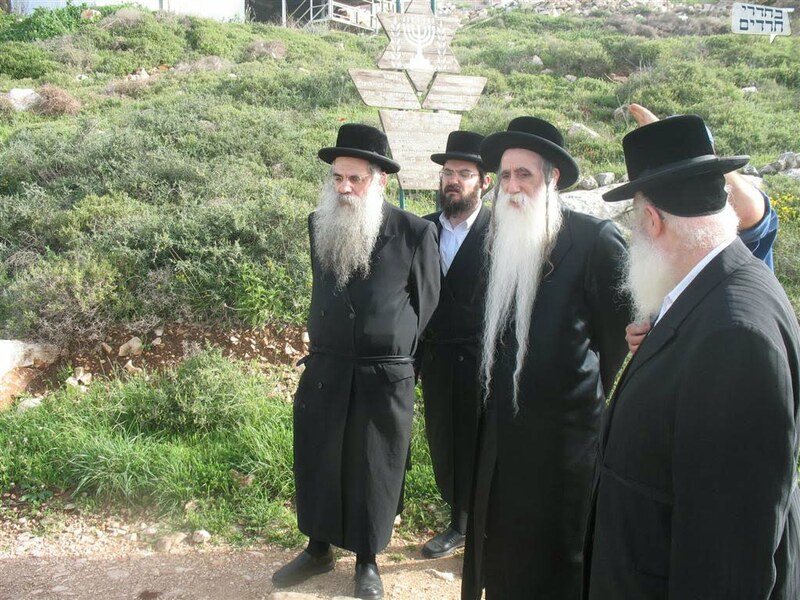 Any Chabadnik worth his salt knows about Reb Yisroel, as well as any yungerman who knows about anything in Eretz Yisroel should know about Reb Yisroel. I learned lots of new things from the book, like the fact that he was an eynikel of MaHaRY"L, the AR's brother, and his father's name Moshe Schneur Zalman was for the Alter Rebbe and Moshe Rabbeinu - him being born on 7 Adar. The family history is rich - rich I tell you, real geshmakke Yiddishe personalities, one by one, from all sides of the spectrum. Litvish, Russian, Galicianers, you name it. If I had the cash I would buy it. 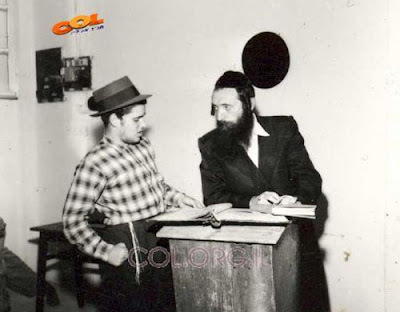 If you know RYG's history you know that he joined the "Alte Karliner" after Reb Yochonon passed away. For those of you in Crown Heights that means that he never accepted Reb Yochonon's eynikel as Rebbe. Some 7 years after RY's passing they crowned Reb MosheMordche Lelover as Rebbe, and "Karlin-Lelov" was born. Most of the "yunge" waited a few years and took Reb Boruch Shochet - his daughter Feigele's eldest son- as Rebbe, despite the culture gap. Reb Yisroel was in his early 30s at the time, so he wasn't technically "old" at that time, but you get the drift. They say that the real rift happened way before, when Di Alte - or their parents - became chassidim of the Karliner, Reb Avrohom Elimelech, HY"D, after the passing of Reb Yisroel, Der Frankfurter, and not of Reb Moshe Stoliner nor of Reb Yochonon, and they never REALLY accepted Reb Yochonon as Rebbe, even after he was the only one left after WW2. "They did because they had no choice," the yunge say, "so they're not really chassidim anyway, so who cares what they think about our Rebbe," they add. In any case, when they get to that point in time of Reb Yisroel's life they do some kind of job on history. There was no eynikel. There's no big shul at Avinoam Yellin 11. There are no hundreds and hundreds of Stoliner families. There was only Reb Moshe Mordche Lelover and then there was Reb Aron Rosenfeld of the newly-established Pinsk-Karlin, and now his son. That's right, my friends, History was thrown to the wind here, and nobody but me is raising the issue, IIMSSM. Why they do that when every young bocher'l knows otherwise is beyond me. It seems like in Israel they STILL haven't realized that censorship of that magnitude just doesn't work anymore. Truth be told, the yunge (Stoliner) would do the exact same thing, but I haven't seen - and am not discussing - that book now. What the author has done is that he's one-upped the Stoliners by publishing some real good pictures - some of which were totally unknown, and some of which were erroneously presented until now, like the one of the Yenukah traveling in a wagon, or at least that's what we thought until now. Now it turns out to be his SIL, Reb Avrohom Shapiro of Gwodzisk, with the shver all the way in the back in another wagon altogether. While you're home with the family enjoying the beautiful YomTov, think of a fellow Jew who's not, who's languishing in a State Penitentiary for very little reason while he awaits sentencing.